The Assyrians are represented in the UNPO by the Assyrian Universal Alliance (AUA). They were admitted to the UNPO as a member on 6 August 1991. Assyrians are one of the indigenous populations of modern-day Iraq. The Assyrians’ ancestral homeland is spread over northern Iraq, northern Iran, south-eastern Turkey and southern Syria. The region from the Hakkari Mountains in Turkey to the Mosul district in northern Iraq is the Assyrian nation’s ancestral homeland, with Nineveh as its historic capital. The Assyrian nation is composed of multiple sub-identities known as Souyrayih, Chaldeans, Nestorians, Syriacs, Jacobiets, Maronites, and Arameans. They are all coming from an historical heritage that is extracted from the Assyrian ancestry. The AUA acknowledges that all of the above mentioned diversities, collectively, are an integral part of the Assyrian nation, each with equal and non-discriminatory right and privilege with respect to one another. After the collapse of Saddam Hussein’s regime in 2003, following the political instability many Assyrians had to flee their homes to seek refuge in Northern Iraq or in neighbouring countries. The situation worsened considerably following ISIS occupation of Mosul, in 2014. Homes owned by Christians were painted with the Arabic letter abbreviating the term Nassarah – ‘Christian’ – and their houses were declared as belonging to the Islamic State. Assyrians and other minorities in the city have endured targeted persecutions in the form of forced displacement, sexual violence, and other blatant human rights violations. On 18 July 2014, the last Iraqi Christians fled Mosul following the release of an ISIS statement saying that minorities should convert to Islam or pay a jizya (protection tax) and those who do not comply would be killed. All 45 churches and monasteries inside Mosul were burned, looted or completely destroyed by members of ISIS. Assyrian Christians were around 1.4 million before the 2003 invasion. They are currently reported to only remain about 300,000 Christians in Iraq. They are mostly in Baghdad, Mosul and the Nineveh plain, Kirkuk, Basra as well as the three governorates in the Kurdistan Region. This means that a third continue to remain in Iraq. Their population continues to shrink. Church officials claim that more than six Assyrian Christian families leave Iraq every day. In 2011, Assyrian Christians represented 52 percent of new UNHCR-registered Iraqi refugees in Turkey and more than half of new UNHCR-registered Iraqi refugees in Lebanon. The statistic is alarming when considering that the community represented only 3 percent of the Iraqi population before 2003. Furthermore, religious extremism has made Iraq and Syria an insecure place for non-Muslim religious groups. It has made the practice of Assyrian cultural rituals, including church services, increasingly difficult. Today, the Assyrian population in Iraq and Syria continues to be subjected to violations of their human rights. The main abuses of international humanitarian law are discrimination, forced displacement, and arbitrary executions. Without increased protection by all levels of the Iraqi and Syrian Government, Assyrians face the reality of no longer remaining a viable component in Iraq’s and Syria whereas they were once a vibrant part of the social fabric. Therefore, Assyrians fully support the efforts to consolidate a united, secular and democratic Iraq and Syria, able to respect and bring together its culturally diverse society. Assyrians have played an instrumental role in the development of modern-day Iraq, Syria, Iran and Turkey. Nowadays, they should be considered as pivotal to these countries’ economic, political, and social recovery and development. To protect their rights, UNPO believes in the imperative implementation of the Article 125 of the Iraqi Constitution to assure the safeguard of the administrative, political, cultural, and educational rights of Assyrians within Iraq’s federal constitutional framework. UNPO believes that it should be the first step to achieving the unequivocal recognition of Assyrian nationhood by both the Republic of Iraq and the international community. Assyrian assertions of autonomy within Iraq are set within the context of the Iraqi Constitution and are based on the popular support of Assyrian communities in Iraq and abroad. The Assyrian nation is the indigenous people of Mesopotamia which Syria is a main part of it, and this nation has become a minority in their lands in terms of numbers and political influence. During this Syrian war, the Assyrians suffered tremendously in many levels where they saw their largest concentration of villages emptied of its people. In 2015, ISIS attacked the peaceful villages of Khabour valley and kidnapped over 235 people, in addition to destruction, theft, and murders. From 33 villages, now they’re reduced to only 4. A constitutional recognition of the ethnic rights of non-arabs (Assyrians, Kurds, Armenians), and of the religious rights of non-Muslims (Christians, Druze, Yazidi) to create assurances for these groups of full equality. In Iraq, the creation of an Assyrian administrative unit within the Iraqi federal framework was already foreseen under the Transitional Administrative Law (TAL) and incorporated into the 2005 Iraqi Constitution. Acknowledging territoriality to Assyrians would mean guaranteeing political representation and physical protection. The ongoing intimidation of Assyrians within Iraq, Syria and Turkey and the failure of these countries governments to prevent attacks against the Assyrian communities has made the establishment of an autonomous region a prerequisite for the protection and promotion of the Assyrian nation and culture. In this context, UNPO supports Assyrian calls for an autonomous region, which would allow the return of those who fled their homes over the years of persecution. Assyrian or Aramaic is listed by UNESCO as a “definitely endangered” language with an estimated only 240,000 speakers. Within Iraq, it has always been considered a minority language. In 1972, the new Ba’athist government issued Presidential decree #251 which granted cultural rights to Assyrians (considered as ‘Syriac speaking Christians’) and autonomy to Iraqi minorities. However, with Saddam’s ascension to power, decree #251 was revoked and many Assyrians schools stopped teaching Syriac in favor of Arabic. Despite constitutional guarantees, in the Iraqi Constitution and the Kurdistan Regional Constitution, minority religions do not receive adequate protection or state support. Iraqi government lacks effective capacity or incentives to protect Christian communities from abuse. Current violations of Assyrians religious rights include the ongoing church bombings in which 59 churches were attacked since 2004, forced conversion to Islam, kidnapping and assassinations of members of the clergy and the destruction of Assyrians shops. 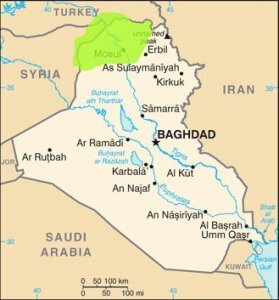 In June 2014, following the Islamic State’s capture of Mosul, a fatwa was issued to all non-Muslims in the city to either convert to Islam, pay a tax, flee, or be killed. Almost all of the city’s 35,000-50,000 Assyrian Christian residents escaped Mosul, ISIS members marked their homes with the Arabic letter “noon” to symbolize the word “Nasrani,” a pejorative term meaning Christian. In late June 2014, the Chaldean Catholic Church's Archbishop of Erbil stated that for the first time in 1,600 years, the mass was no longer led in Mosul. Many of Mosul’s displaced Christians initially sought refuge in the Nineveh Plain region, one of the only places within the country that was historically dominated by native non-Muslim and non-Arab populations. It also used to welcome the greatest concentration of Assyrian Christians in Iraq. On 6 August 2014, the largest wave of displacement came after nearly all of the roughly 200,000 mostly Assyrian Christian inhabitants in the Nineveh Plain, including many who have endured repeated displacement, fled to the Kurdish Region as ISIS fighters were gaining territory. The resulting humanitarian crisis has garnered the highest-level emergency designation by UN officials as tens of thousands of perpetually uprooted ethno-religious minorities struggle to access basic services. Additionally, fact-finding reports in Iraq revealed that the deportation and forced transfer of population by the Islamic State may amount to crimes against humanity against Assyrian Christians and other communities. Please download our Assyrian Member Profile Brochure.